One often hears talk of business values and models. Mission, vision and value statements, while important, are commonplace. In an effort to truly elevate the adoption, cultivation and practice of core business philosophy that flows just as much from the heart as the bottom line, Rainbow International® is a proud proponent of the Code of Values. 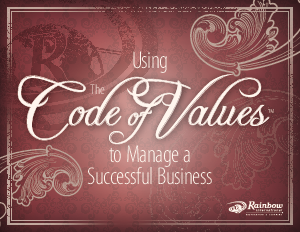 The Code of Values serves as a set of universal guidelines to which all employees adhere. This applies at the corporate office, every individual franchise location and on every job and customer interaction.